Jonathan Ross has repeated his apology over the lewd calls row while filming on his first day back at the BBC following his three-month suspension. He told the audience of his Friday Night with Jonathan Ross show he had "a great responsibility" as a presenter, according to audience members. He would be "more aware" in the future, he added. Ross was suspended after making a series of phone calls to actor Andrew Sachs on Russell Brand's Radio 2 show. Ross's opening words were: "So, where were we?" according to a Sky News reporter who was in the studio audience. After joking about outgoing US president George Bush, he said: "What kind of idiot would say stuff like that, knowing it would be broadcast? "Seriously, I would like to apologise. "We have got a great responsibility, what we do is a privilege and I will be more aware in future." The BBC said that one member of the audience was asked to leave after they were suspected of recording the show. Guests on the TV presenter's BBC One show were Tom Cruise, Lee Evans, Stephen Fry and rock band Franz Ferdinand. Fry, posting on Twitter, the mobile phone-based micro-blogging service, said: "All over. Won't reveal too much as press seem anxious to be all over this. "JR and I discussed Twitter. Hope it makes the cut. Cruise charming." 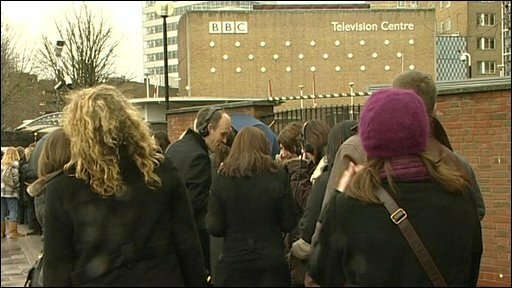 Speaking outside Television Centre in west London after filming, audience member John Wood, 49, from East Grinstead in Sussex, said that during one gap in filming Cruise told Ross he never had any time off. "Jonathan Ross joked, 'well, you want to try getting banned' - it was really funny," Wood said. Ben Parks, 18, from Sheffield, said: "Jonathan Ross kept quiet for the first two guests but he was really funny with Tom Cruise. "Everybody was a bit surprised when he made the apology." In Brand's Radio 2 show in October, Ross and Brand left obscene messages on Sachs's answerphone claiming Brand had slept with the actor's granddaughter, Georgina Baillie. The pre-recorded show caused little reaction when it was first broadcast on 18 October. However, after the content was publicised in a national newspaper, more than 42,000 people complained about the content. BBC bosses then carried out a review and suspended Ross without pay for three months. Brand issued a public apology and resigned from his BBC show. Tom Cruise, who attended the UK premiere of his latest movie Valkyrie on Tuesday night, told the BBC he had been briefed about the phone calls row. "I know a little bit about it and have done interviews with Jonathan Ross before when I've come here, so I'm looking forward to seeing him," he said. The show is on BBC One on Friday at 2235 GMT.